If you need to buy monitors for mounting on a monitor mount / stand read this first. It will save you a lot of time and frustration. One of the most important benefits of using multiple monitors and mounts is increased productivity and efficiency. That starts with a high quality multi display computer system and an ergonomic monitor mount. Once you have a computer and a monitor mount, you have to make sure you choose the right monitors. When buying monitors try to meet as much of the criteria mentioned below as possible. Due to continual changes in monitor styles, bezel size, button placement, bases etc, monitors may not meet all of this criteria, but get as close as you can. Your choices will be narrowed even further once you take video connections, resolution and other variables into account. These are the things you need to look for when shopping for monitors that you plan on installing on a monitor mount. The very first thing to verify when you are shopping for monitors is to confirm that they are actually mountable on a monitor stand. The reference to look for in the specs is VESA compliance, or “wall mountable” in the description. The standard is 75mm or 100mm depending on the size of the monitors. If you are going into a local retail store, walk down the monitor isle. Turn the display unit around and look at the back. There should be 4 holes in the dead center about 4″ apart. Sometimes the holes are covered by the base that comes with the monitor, but you will be able to tell. That base will come off when you mount them on the monitor stand. Once you have verified that, there are certain parameters you will want your monitors to have if possible. In other words you don’t want monitors that have a rounded bottom if you are using a monitor mount with two rows. Think about it. If you have 2 rows of monitors, there would be a gap between the bottom of the top row monitor and the top of the bottom row monitor. Spaces are distracting. You want all of your monitors to be as close together as possible with no gaps. For the same reasons mentioned above, try to choose a monitor that does not have buttons that protrude on the bottom edge if you can. If you find a monitor that you really like but the buttons are on the bottom or back, you may have to live with that sacrifice. Again your monitor choices will get narrowed very quickly once you start adding all of these variables. 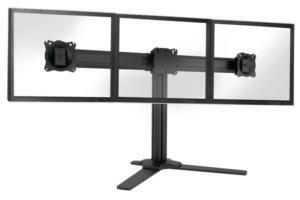 ​When deciding on a monitor mount, consider how many monitors you have and the width of each. For example if you plan to have 3 x 24″ monitors wide, make sure you have enough space. That would be exactly the horizontal width of those 3 monitors, roughly 67″ in this example. This is important to consider because the wider your monitors, the further you will need to rotate left and right in your chair. The bezel is the plastic frame around the edge of the display. The smaller the better. Remember when you mount 2 monitors side by side, the space between your displays will be doubled based on the bezel size. For example let’s say your monitors have a 1 inch bezel. When you put two monitors side by side, that is now 2 inches of space between your display area. This is very important. The type of connections that your monitors have available, must be in sync with the type of connections on your video cards in your computer! All NTI QuadStation computer systems provide support for DisplayPort and DVI. DisplayPort supports up to 8K resolutions, DVI supports up to 1920 x 1200 max. The most popular video connection and by far for the best image quality will be on a DisplayPort connection. If the monitors you are looking at meet all (or most) of the parameters above, and they have DisplayPort, you have a winner. Aside from being mountable, this is the most important parameter. The second choice would be DVI. Also a digital port, DVI has been the most popular connection for many years. However DisplayPort has now taken the lead as they are now more mainstream. In other words, monitor manufacturers are finally starting to see the benefits and providing DisplayPort connectivity on their monitors. VGA? Forget about it unless you have no other choice. This is an analog connection (not digital) and has been dropping away for years now. If you have older monitors that only have VGA and you still want to use them with a new computer, consider this. New computers have all digital connections now. So you would have to put in OLDer style video cards to get VGA, and they are becoming more and more scarce as of this writing. If you are buying a new computer you may be better off buying new monitors as well. Otherwise you are putting an older video card (and older technology) in your new machine. Control Rooms, call centers, law enforcement often require smaller 19″ monitors and VGA. This would be the only exception we can think of to use VGA type connections. HDMI. We are often asked about connectivity to HDMI. But unless you are specifically connecting televisions, forget about HDMI. It is not meant for a multi display environment at all. And there are no multiple display HDMI video cards. HDMI is made for TV not so much for computers. TVs use HDMI, computers use DisplayPort and DVI. As mentioned if you are buying a new computer, it will most likely come with either DisplayPort or DVI connections on the video card. You need a video cable to connect from your video card out to your monitors. Sometimes these come with the monitors but they are rarely long enough at only 4ft or so. We provide 10ft cables with all of our systems. If your monitors have DisplayPort and your new computer has DisplayPort, that is as good as it gets. You will need DisplayPort to Display cables, no adapters needed. If your monitors have only DVI, you will need a DisplayPort to DVI adapter or cable to convert from DisplayPort to DVI. If you must use HDMI out to a TV you will need an Active DisplayPort to HDMI adapter. ​In the world of digital video cards and monitors, it is best that you use the same exact make and model monitors. However, that is not always feasible. Let’s say you have 2 good Samsung monitors and you just bought 2 Viewsonic monitors. That is fine. But, depending on the video cards in your computer, you may need what are called ACTIVE video adapters. Remember you may not be able to find a monitor that meets ALL of the parameters mentioned above but get as many as you can. You will find that when shopping this criteria limits the monitor selection very quickly, actually making it easier to choose.